You already know, but you may want to read a refresher anyway. Waze is a crowd-sourced, free app currently available on the iPhone, Android and the Windows Phone platforms. Waze incorporates real-time GPS data from its more than 50 million users and delivers highly accurate and useful traffic and navigation information. Since the acquisition by Google in June 2013, users can now access Google Street View via Waze Livemap. Is Waze popular in Malaysia? Waze is ranked at #16 across all categories in the App Store in Malaysia. Waze has nearly 1.5 million active users in Malaysia and Malaysian users among the Top 15 largest Waze communities. Over 3300 map editors in Malaysia actively contribute to the Driver Generated Livemaps. Through the broadcast partner programme, Waze aims to bring its citizen-traffic reporting platform to the mainstream media - bridging traditional media with social networks and mobile content to augment TV traffic reporting. Now that’s something isn’t it – a MALAYSIA first! What can YOU expect from Astro AWANI as Malaysia’s first broadcast partner for Google’s Waze? Daily live traffic updates from all over Malaysia – we are targeting to launch in early 2014. 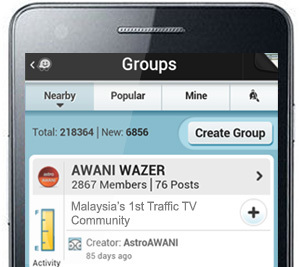 Meanwhile, YOU can join the AWANI WAZERS group and watch out for exciting stuff heading your way real soon! 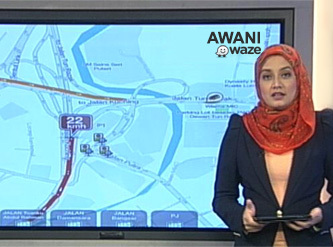 How do I become an AWANI WAZER? Copyright © Astro Awani Network Sdn. Bhd. 2019 (535275-D). All Rights Reserved.